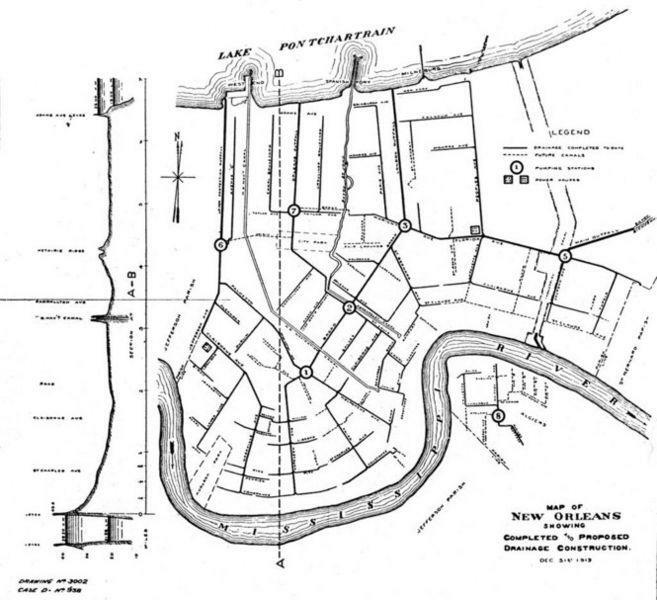 New Orleans, 1913 map, showing system of drainage culverts, canals and pumping stations. Should water be pumped out of New Orleans, or kept in? The new strategy says: do both. Ehrenfeucht is an associate professor of planning and urban studies at the University of New Orleans. She focuses on how cities deal with population loss, vacant land, changing neighborhoods, and how the government adapts. We have managed water here in New Orleans, says Ehrenfeucht. We receive an average of 64 inches of rainfall each year. Bridget Kelly has these calculations on her mind. She’s a board member for The Land Trust of Louisiana, which serves to preserve and protect natural areas and open green space. Kelly’s focus right now is an open lot on the corner of Mazant and Royal streets in the Bywater, across the street from The Joint BBQ. Bywater Square showing water pooling after an afternoon of rain. A few different developers are looking to build housing units on the Bywater Square, but Kelly is determined to keep it green space. Kelly dreamed of a park, but she had to embrace water management to get there. If she talked about a nice place for kids to play, she got lukewarm responses. But if she talked about the land as a tool, ears went up. That means investing in things like special swings that help channel water somewhere useful. Cedric Grant is the executive director of the New Orleans Sewerage and Water Board. He says the way we manage water does need to change. 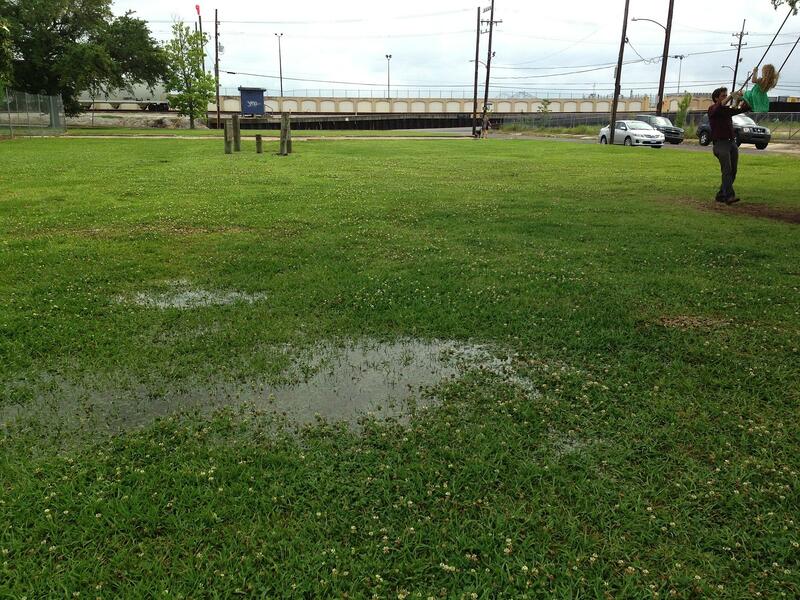 Instead of spending money to keep water out, the Sewerage and Water Board is looking at how to retain and hold water. That way rain won't all rush to the drainage system and overload it. In New Orleans East, for instance, some new roads have been laid down using a special permeable pavement, allowing the water to seep into the ground instead of flowing straight to the pipes. But Cedric Grant isn’t turning his back on what the city already knows how to do. 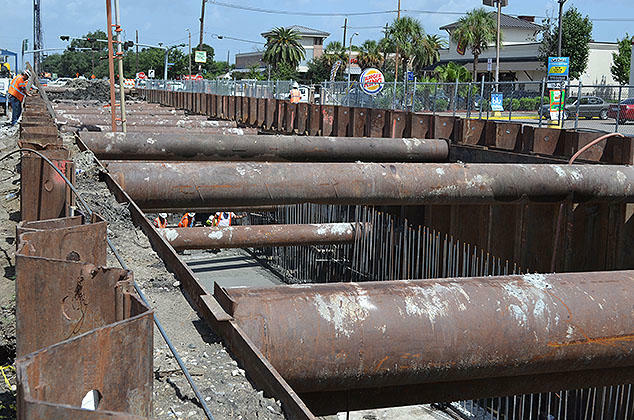 Construction of a new drainage canal on S. Claiborne Avenue as of August 2014. Back in the Bywater, Bridget Kelly and the Land Trust of Louisiana have a one year lease on Bywater Square, but the term ends in October. She’s hoping the lease will be renewed, and wants the city’s support. The City Council is currently reviewing a new stormwater management section of the comprehensive zoning ordinance. If passed, any property owner who wants to redevelop a site more than 5 acres in size would need to have a water management plan. Many ideas have been suggested for how to handle New Orleans’s pervasive blight problem. 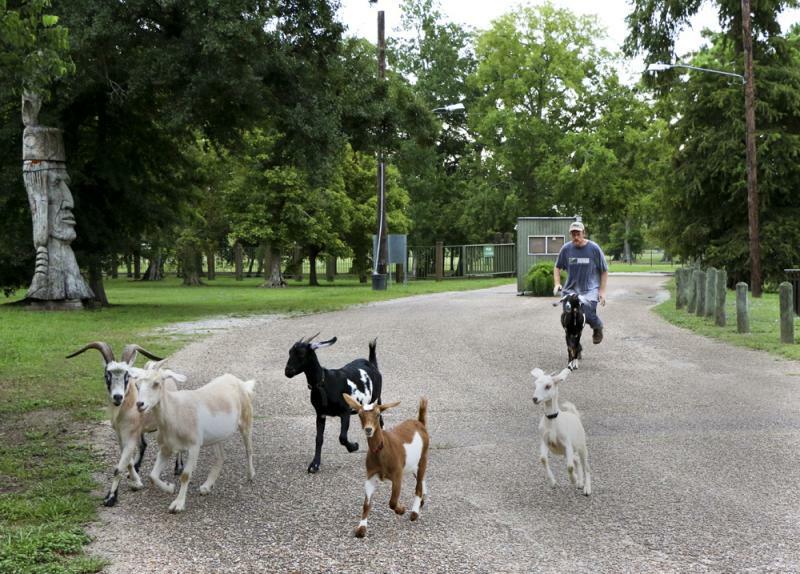 Reporter Michael Patrick Welch and his wife Morgana believe the answer is goats. 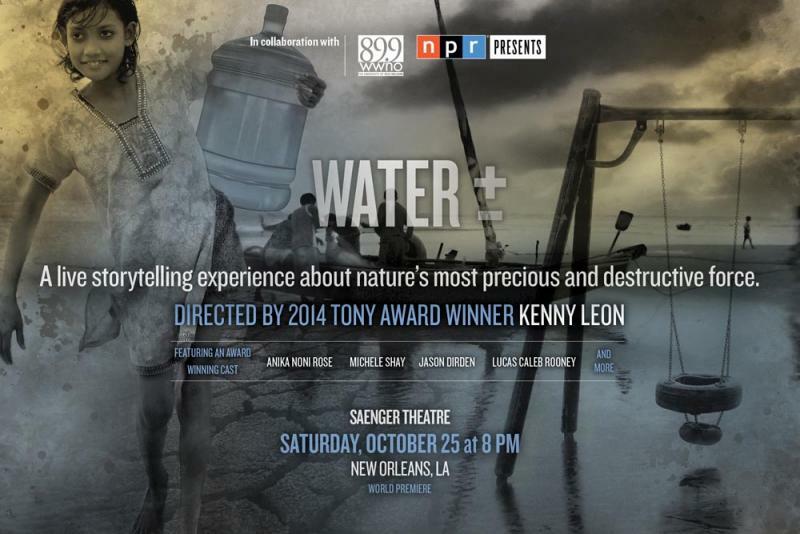 JOIN WWNO AND NPR FOR A WORLD PREMIER THEATRICAL STORYTELLING EVENT, "WATER," DIRECTED BY TONY AWARD WINNER KENNY LEON AND HOSTED BY NPR'S MICHELE NORRIS, MUSIC FROM MEMBERS OF THE VOICE OF THE WETLANDS ALL-STARS.